The Lord hath spoken! Coca Restaurant emailed me the list of winners from the Coca GONG XI Giveaway. There are three (3) winners and each of you gets a voucher worth RM 150 to dine at Coca Restaurant in 1 Utama or Subang Parade. The voucher is a steamboat set meal for two so bring your dining companion along! OMG! I thought the ones with permalinks have priority? The ones who posted a link back? It turns out that the permalinks DO have priority. They get weighted more heavily than normal comments but Coca Restaurant is using random.org to be fair. Thus, out of the 54 comments, the permalinks are all ranked in the Top 10, but unfortunately, due to some catastrophic cosmic bad luck, none made it into the Top 3. I will email all the 3 winners in a bit – please tell me if you’re not in Klang Valley so I can ask for permission to pass the vouchers to the permalinks (or the next in the list). 1. 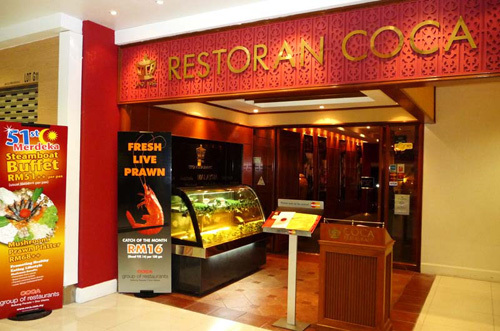 Collect your vouchers from Coca Restaurant, 1 Utama from Friday (6th February 2009) onwards. 2. Just state your name (nick) and sixthseal.com to get the vouchers. 3. You need to collect it from Coca Restaurant within 2 weeks. 4. The vouchers are valid till 31st March 2009. 5. Make reservations with the Coca staff before you go.